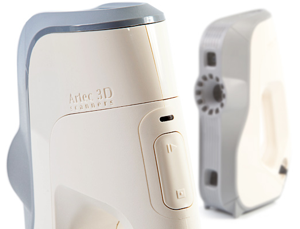 Artec 3D scanner - EVA is the ideal choice for those that need to receive a quick, textured and accurate scan. Eva doesn't require markers or calibration. It captures objects quickly in high resolution and vibrant color, which allows for almost unlimited applications. Capture objects in seconds Artec Eva 3D Scanner is similar to a video camera which captures in 3D. The scanner captures up to 16 frames per second. These frames are aligned automatically in real-time, which make scanning easy and fast. This is especially important for the creation of special effects, medical and biomechanical research. Because of the high quality, Eva’s textured models can be used in such industries as CG/Animation, forensics and medicine. High speed and accuracy Capturing and simultaneously processing up to 288,000 points per second, Eva scans a dozen times faster than a laser scanner, while providing high resolution (up to 0.5mm) and high accuracy (up to 0.1mm). No markers, no EM tracking, no calibration Eva does not require cumbersome calibration procedures at the beginning of each scanning session. Eva does not need markers to be placed on the object before scanning. Eva does not use electromagnetic tracking, so metal objects in the room do not interfere with performance or accuracy. 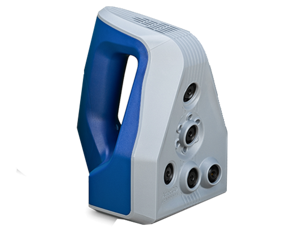 Artec 3D scanner - Space Spider is a new and enhanced precision instrument for CAD users and engineers. It's perfect for capturing small objects or intricate details of large objects with steadfast accuracy and brilliant color. Originally developed to spec for the International Space Station, this next generation 3D scanner features powerful temperature stabilisation and high grade electronics, which not only allow the scanner to reach maximum accuracy in three minutes – ten times faster than Spider – but also ensures long-term repeatability in data capture, since Space Spider’s accuracy is not affected by fluctuations in environmental conditions. In Space Spider, Artec 3D scanning technology has been honed to perfection to ensure the best possible quality of scans and a truly robust device, making it possible to double our standard warranty period.